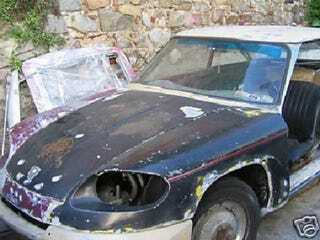 Latin Lover’s Panhard 24CT for $4,000! Today Nice Price or Crack Pipe wants you to have a Uruguay old time with a car that's foreign on two fronts, and that you may be able to bring home in your carry-on. Yesterday's Tempest dropped its top for you, and garnered a 84% Nice Price vote, despite needing some "TLC." Today we're heading south for a similarly priced car with half the cylinders, but in need of four times the "C."
French maker Panhard built the lovely and svelte 24CT from 1963 until the company ended civilian car production in 1968. Looking like a mixture of Corvair, NSU Prinz and Citroën, they became popular on the continent for their style and efficiency. The 848cc air-cooled twin is able to push the slippery shape through the air up to almost 90mph, and for years, the similarly powered DB Panhards dominated the Index of Performance class at LeMans, vexing many a class-H competitor. The 53bhp produced by the Panhard twin is made without traditional coil-type valve springs – using torsion bars instead – and leading to a weed-whacker sound when running. The eclectic nature of all Panhards extends beyond the use of that unique H-twin engine to the rest of the car. What appear to be wheel covers are, in-fact, the polished outer surfaces of the artistically finned brake drums, the wheels mounting to their outer rims. The steering wheel is oval, because. . . well, just because, and all the brightwork is stainless steel. Today's 24CT is a bit of an enigma. And it is located in beautiful Uruguay. Based on the seller's description, that's pretty much all we know about the car, and little more may be gleaned from the pictures he provides. Those shots of the car paint a somewhat gloomy picture, and who knows how much of the non-evident parts have long since gone the way of former Uruguayan president Juan Idiarte Borda. Speaking of Uruguay; in addition to being the second-smallest nation in South America, it is also claimed to be one of the most corruption-free democracies on the continent, and at one time was even the location of Panhard manufacture! Who knows if this is one of those Latin American-built cars, or if it was brought over by one of the many Europeans who emigrated to Uruguay over the years. Either way, at one of only 25,000 ever built, and with fewer than that remaining, it's a pretty rare rana. So does $4,000 for this South American transplant make you want to Live Free or Panhard? Or does it's price and locale give you uruguabies? eBay, or go here if the ad disappears. Help me out with NPOCP. Click here to send a me a tip.